Getting involved in community activities helps tweens build self-esteem, make lifelong friendships, and discover their interests and passions that will carry them through life with self-awareness and success. For PJ lovers who’ve outgrown the program, PJ Our Way allows kids nine to 11 years old to select their own book each month. 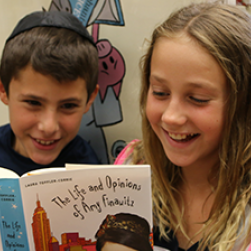 This gives them more choice on their journey to becoming life-long readers while introducing them to Jewish ideas in age-appropriate ways. As part of the program, PJ Our Way participants can create book trailers, videos, quizzes, author interviews, and other media to communicate with peers about the books. J-SERVE is the international day of Jewish teen service, when more than 10,000 6th through 12th graders from across the globe come together to fulfill the value of repairing the world. In the heart of NJ, hundred of volunteers participate in a wide range of community-service activities, from visiting seniors in assisted living to planting a garden for preschoolers and sending video greetings to soldiers. Jewish summer camp is a great way to inspire kids to embrace their Jewish identity, gain valuable life skills, and make good friends. The Federation supports and offers many ways to make day camp and sleepaway camp more accessible and affordable. For those who don’t know if Jewish camp is for them, the Jewish Federation offers incentive grants in partnership with The Foundation for Jewish Camp’s One Happy Camper program. Exciting kids about Jewish camp is a great investment in our future because it often leads to future involvement in Jewish community. In addition to teaching great life skills, Jewish camps offer world-class programs in athletics, the arts, technology, and more. For working families who need help affording child care when school's out, summer camp is not a luxury, it’s a lifeline. Their children spend the summer in a warm, safe, Jewish environment filled with fun, learning, and friendship. Children with special needs can share in the magic of Jewish camp to learn new skills, build self-confidence, and make lasting friends and memories. Scholarships from the Jewish Federation can put camp within reach and enable all Jews to find their place in the warm and supportive community of Jewish summer camp. If you're considering sleep-away camp for 2019, now's the time to start planning. Tour camps during the summer to see them in action.